Rachel has been a SAR volunteer since April 2001, and participated in numerous searches in WI, MI, MN, IL and MO. 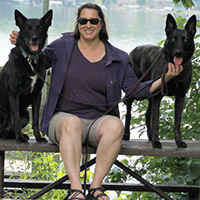 She was a founding member of WI K9 SOS and served as President (1/15 - present), Vice President (5/05 - 1/15), and Co-coordinator for K9 Training (5/05 - present). She has trained 3 SAR partners, certifying in live area scent and land & water cadaver (with Law Enforcement Training Specialists, Int’l). Rachel has earned her SARTech II certification with NASAR (National Assoc. for Search & Rescue), as well as completed many other courses related to incident command, scent theory, search strategy, 1st aid, K9 1st aid, and many others. Rachel is a principal evaluator for land HRD, live area scent, and area live + large source with the National Search Dog Alliance (NSDA). She is currently a member of NSDA. She enjoys spending all of her vacation time traveling to SAR seminars throughout the country. She is very grateful for the education she’s received, as well as the life-long SAR friends she’s made across the U.S.
K9 Riken 2014 - present. Certified land & water cadaver (L.E.T.S.). Certified land cadaver (NASAR 2015). CGC 1/15. K9 Chiron, 2001 - 2004. Certified live area search. 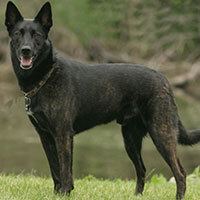 Koga (Blue Koga vom Foxtal) is male Dutch Shepherd born in 2005. Koga will do anything to earn his two-handled reward toy, but his greatest joy is locating missing people alive or deceased. Even as a senior SAR dog entering retirement, he still shakes with excitement whenever he thinks it’s “his turn.” Koga has been described as very focused, and living only to work. This is not entirely true: Koga has a wicked sense of humor, and also enjoys torturing house guests by relentlessly dropping toys in their lap to be thrown for him. Riken (Vrijheid’s Riken) is a female Dutch Shepherd born in 2014. She is certified in land cadaver through NASAR, and land & water cadaver through L.E.T.S. Int'l. Riken enjoys working, especially on the water. At her young age, she also greatly enjoys exasperating her handler. Riken's reward is a 2-handle tug. If you have her toy, watch your fingers! She LOVES to play tug.